I recently read surgeon and journalist Atul Gawande’s bestseller “The Checklist Manifesto: How to Get Things Right.” It’s about the power of checklists. For example, a five-step checklist saved 1,500 lives and $200 million by reducing infections in Michigan hospitals. The first step on that checklist was that the doctor must remember to wash his or her hands. 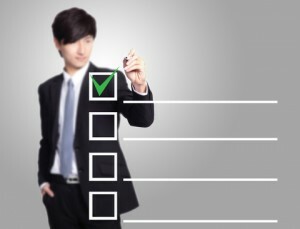 That got me to thinking about putting together a checklist for winning new business presentations. Checkpoint 1: Before the presentation, speak to the client. I worked with an architecture firm that was shortlisted for the chance to design a corporate headquarters. They had no idea what motivated the project. I told them that without more information about the client’s needs, they had almost no chance of winning. Checkpoint 2: Present solutions only. If it doesn’t bear on your plans to solve the client’s problems, dump it. If you’re up for a chance to help a client save money on the cost of client acquisition, talk only about how you’re going to address the key challenges the company will face. Checkpoint 3: Start by Articulating the client’s business problem. First words out of your mouth? How about “We understand that the key challenge you’re going to face in this matter is how to limit liability while at the same time training your existing employees how to comply with current law.” Don’t know what their key challenge is? Either see checkpoint 1, or save everyone time and stay home. Checkpoint 4: Limit your message to a few key points. Our plan to train your employees. Checkpoint 5: Tell success stories. One of the easiest ways to build credibility for a solution is to tell how the solution has worked elsewhere. “We used this same approach for another company just like you and they are thrilled with the result.” Then show what you did for that other company. Checkpoint 6: Create a list of 50 questions. Fumble just one question and you’re toast. So be prepared. I recently worked with a construction firm as they prepared a pitch for a large hospital construction job. I urged them to send an email to their entire firm asking for suggested questions. They received 150 questions and weren’t surprised by a single question. Of course, you need to practice answering the questions. Checking off these seven points may not save lives. But it may help put your kids through college.